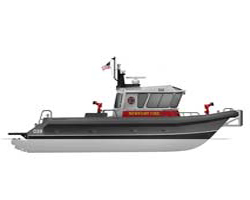 Californian naval architect and boatbuilder Moose Boats has been contracted to build a new emergency response and recovery vessel (ERRV) for Rhode Island’s Newport Fire Department. The vessel will be built to the specs of Moose Boats’ 11.6m-long M2-38 catamaran class and is primarily intended to provide firefighting and SAR services in and around both Newport Harbour and approximately 60km of coastline surrounding the city of Newport, which hosts a number of high-profile sailing events each year. The M2-38 will be built with chemical, biological, radiological and nuclear (CBRNE) protection in mind, and is set to feature a radiation detector, breathing apparatus and external air sampling technology. The cat will also be equipped with multifunction navigation screens, radar, a 3D side-scan sonar, AIS and a thermal imaging camera. A heavy-duty push knee fender will protect the boat’s hull when coming into contact with larger vessels and piers. The vessel will also carry a combination ladder to facilitate dive and rescue operations from the stern, Moose Boats says. Power will be provided by a pair of 317kW Cummins engines, each driving a Hamilton-manufactured waterjet. For firefighting purposes, the cat will rely on two independent fire pump systems, each capable of delivering more than 6,820litres of water per minute.